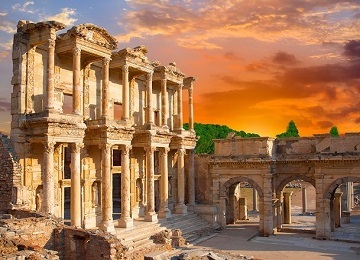 After approximately 1 hour early morning Istanbul-Izmir flight, you will be transferred to Ephesus, the best preserved ancient city of Roman period which used to contain one of the seven wonders of the ancient world, the Temple of Artemis. Flight from Istanbul to Izmir (approximately 1 hour). Transfer from Airport to Ephesus tour. Full day tour of Ephesus and House of Virgin Mary, including transfers, entrance fees, guide. From Kusadasi, you travel north to St. John’s Basilica, passing the Byzantine fortress at Selcuk and the ruins of the Temple of Artemis. Continue to Ephesus Open Museum then up to the House of Virgin Mary located in Bulbul Mountain. After the visit head for the upper gate of Ephesus. By the end of touring Ephesus, return to Kusadasi. Lunch during the tour is included. Dinner in your hotel included. 4* hotel accommodation in Kusadasi. 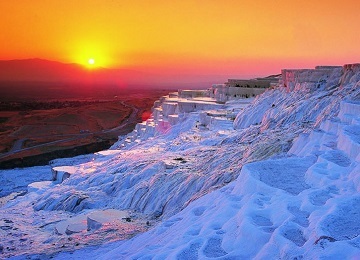 Pamukkale & Hierapolis tour including transfers, entrance fees, guide. Visiting the amazing white colored travertines, hot spring pools and water terraces have been created by nature in millions of years on the mountain slopes of Pamukkale and the ancient city of Hierapolis which has the biggest ancient Necropolis of Turkey with 1200 gravestones. Overnight bus to Cappadocia, arriving next morning. Optional: Overnight bus ride can be replaced by domestic flight if requested, but please already note that direct flights between Cappadocia and Ephesus area are very rare and you need to fly via Istanbul in most cases. In this case you may need to prolong the tour for an extra day usually; because it is not very easy to match these flights and the tours. Please ask possibilities, if you prefer flights. There will be extra hotel, flight and airport transfers costs for this option, naturally. Transfer from bus terminal to the office of our local partner and have a some time to freshen up before the the tour. We will deliver your luggage to your hotel meanwhile. Full day Northern Cappadocia tour including transfers, guide and entrance fee. This tour will cover the most famous parts of the region such as Goreme Open Air Museum, Avanos, Urgup, Dervent Valley and other sites. Lunch will be served during the tour in a nice Turkish Restaurant. 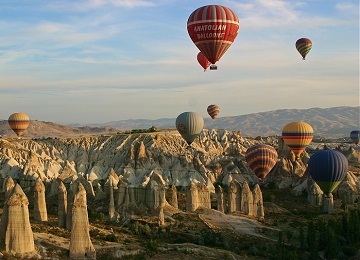 Full day Southern Cappadocia Tour including transfers, entrance fees and lunch. One day is never enough to see the wonders of the vast Cappadocia region, which partially covers 3 provinces of the country. Minimum 2 day tour is a must after coming all the way. You have so many things more to see on your second day, your eyes wide open in amazement. The second day's itinerary will be like this. This tour will cover Pigeon (Guvercinlik) Valley, Uchisar Castle, Kaymakli Valley and other minor sites. Lunch in a typical Turkish restaurant during the day tour is included. Transfer to airport at the end of the tour. Attention: The price of the tours which involves transportations with planes are variable, depending on flight costs. Higher prices may apply based on flight costs on different dates / seasons. Early reservation is highly recommended to secure better prices. Tour itinerary can also be changed because of discordant flight schedules on the requested dates. We will do our best to keep the above itinerary and prices as much as possible. All taxes. No hidden charges. 4 full day tours with professional guidance in English. Entrance fees for museums during the tours. 2 domestic flights as mentioned in the itinerary. All connecting transfers in between the tour period. Personal expenses and any service not explicitly mentioned in the tour program. Surcharges may apply for credit card payments, about which you will be informed in advance. Compulsory local (TURSAB) travel insurance. We will request 25-30 % of the total tour price in advance to complete your tour reservation. You can make the advance payment from our secure online payment link or by mail order. The remaining payment can be made when you arrive to Istanbul. We accept all major credit cards and cash payments can also be also made in Euros Turkish Liras, US Dollars, British Pounds or other international currencies from local cross rates valid on the payment date. Please click here for our other tour packages by plane. What is a package tour ? A package tour is the combination of variety of local tours in different cities in the most practical and economic way, which can be done by professional travel agencies only. Please kindly note that these are package tours rather than typical group tours and you will actually be independent in hotels and during the transportation (bus or plane) except join other people during the daily excursion tours included in the itineraries. The itineraries are organized considering best transportation options. Our agency's basic function here is that, everything will be organized by us and will be ready for you (bus or plane tickets, hotels vouchers, tours as well as most connecting transfers) in advance, and you will not have to deal with each separately, and besides pay much less than you would book them by yourself. Tour prices are advertised for 3 star or budget hotel accommodations. Each of these tours can be upgraded or customized for your personal requirement. Hotels can be upgraded to 4 star, or 5 star hotels and additional hotel accommodation + free day can be added to each tour at any destinations you prefer, bus rides can be replaced with domestic flights where available, Istanbul departure and arrivals can easily be replaced by other cities of Turkey. Except peak summer season, Istanbul Airports are where almost all international flights lands when you come to Turkey. Istanbul leg is not included in any of these packages. To be able to join them comfortably, you need to add minimum 1 night stay in Istanbul to the end & beginning of these package tours - unless your international flights are matching perfectly and you do not want to risk consequences of any possible delays. We can additionally book your hotels and tours in Istanbul if requested. Some tours can also be arranged starting from / ending in other major cities as well. 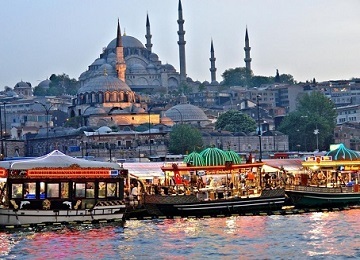 Our Turkey tours don't include Istanbul. You will most probably need a hotel in Istanbul before and after this tour. 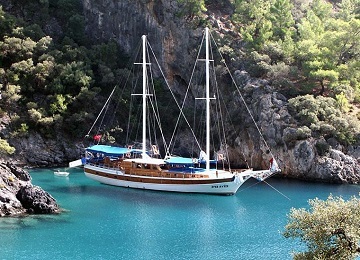 Now you can book all types and quality hotels all over Turkey via our Booking Com affiliate system. * Instant & secure hotel reservation via Booking Com. * Free cancellation and special discounts are available! During both the Hellenistic and Roman periods Ephesus was the most important port and cultural center of the eastern world. The remains of the city are still spellbinding today. Of all the ancient cities of Turkey, Ephesus is the best preserved and most visited in all ages and is as popular as it was in ancient times. This is due to the miraculous discovery of the House of the Virgin Mary. The city had splendid buildings and was dedicated to the Goddess Artemis, whose temple was considered one of the Seven Wonders of the World. The main monuments that we will see during the visit of this fascinating city are: the street of Arcadiane, the majestic theatre, marble road, library of Celsus, market place street of the Curettes, baths of Scholastic state agora, prytaneion, odeon. The town of Seljuk, is dominated by a Byzantine citadel close to the basilica of St. John built in the 5th century, on the site of tomb of the Apostle. Seljuk has also an exceptionally fine archaeological museum. The Artemis Temple was destroyed in 356BC, and when Alexander the Great passed through in 334 BC he offered to pay for the cost of a new construction, provided it was dedicated to him. The Ephesus people declined, and rebuilt it with great success. When the Romans made Ephesus their provincial capital, it became a busy town with great commercial, trading and political importance, and a population that grew to around 250,000. A significant Christian community grew, and the city was visited by St John the Evangelist in the 1st century, then by St Paul, who was there between 51-53 AD and wrote some of his epistles. It was also the venue of two Ecumenical Councils. But the success of Roman Ephesus began to dwindle, mainly because of problems connected to the harbour, which was the main source of trade. The Cayster River was pushing silt up the harbour and despite attempts to dredge it and rebuild the harbour, the sea was pushed back to Pamucak, 4km away, and therefore Ephesus lost its source of wealth. By the 6th century, the city was unliveable and was shifted near to St John’s Basilica, and by 1090 it was taken over by the Turks. Pamukkale is one of the most enchanting and remarkable sights in the whole of Turkey with the great dazzling white plateau, almost 400 feet high, rising in a curtain of stalagmites and shallow pools, giving one into another on hundreds of different levels, and ancient city of Hierapolis located on this plateau. The great baths were constructed in the second century and are so well-preserved that they now serve as a museum. The impressive and recently restored theatre, the Martyrium of St. Philip the Apostle of the 5th century – a colonnaded street erected by Domitian, a monumental gate of the same period, another bath stretching on for over a Mile, the necropolis with a fascinating variety of tombs and sarcophagus are the famous monuments of this antique city. In ancient geography, Cappadocia or Cappadocia (Turkish: Kapadokya) was the name of the extensive inland district of Asia Minor (modern Turkey).Cappadocian region is the place where nature and history come together most beautifully within the world. While geographic events are forming Peribacalari (fairy chimneys), during the historical period, humans had carried the signs of thousand years old civilizations with carving houses and churches within these earth pillars and decorating them with frisks. 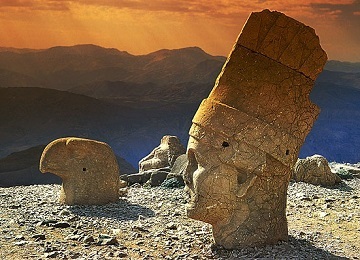 The area is a world famous and popular tourist destination, as it has many areas with unique geological, historic and cultural features.The region is southwest of the major city Kayseri, which has airline and railroad service to Ankara and Istanbul. The Cappadocia region is largely underlain by sedimentary rocks formed in lakes and streams, and ignimbrite deposits erupted from ancient volcanoes approximately 9 to 3 million years ago (late Miocene to Pliocene epochs). The rocks of Cappadocia near Goreme eroded into hundreds of spectacular pillars and minaret-like forms. The volcanic deposits are soft rocks that the people of the villages at the heart of the Cappadocia Region carved out to form houses, churches, monasteries. Goreme became a monastic center between 300-1200 AD. First period settlement in Goreme reaches to the Roman period from Christianity. Houses and churches carved into rocks carries the mystical side of history today. The Goreme Open Air Museum is the most visited site of the monastic communities in Cappadocia and is one of the most famous sites in central Turkey. It is a complex comprising more than 30 rock-carved churches and chapels containing some superb frescoes, dating from the 9th to the 11th centuries.